Engineering Information Technology has appointed two new IT Coordinators to their unit. These positions will assist in the management of the EIT Helpdesk which provides IT support for the instructional and research spaces throughout the Clark School. They will also provide IT support for meeting and conference spaces within the Kim Building, and provide classroom and event support. In addition, these positions will provide direct support for the faculty, staff, and students in the Bioengineering, Chemical and Biomolecular Engineering, Fire Protection Engineering, and the Materials Science and Engineering departments. 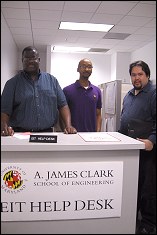 The new coordinators, Mr. Kenneth Ayensu and Mr. D’Mario Headen bring a wide range of experience to the Clark School. Kenneth Ayensu has worked with EIT as a multi-media assistant for the past four years. His experience includes; computer installation, maintenance, and troubleshooting, AV system installation and support, software installation and testing, help desk support, and large scale software deployment. D’Mario Headen previously held the position of Information Support Specialist with the Sun Prairie School District in Sun Prairie, WI. His experience includes a combination of management and technical skills including project management, training session design, and computer system networking. He also has experience with various operating systems, software packages, and programming languages.